The author of this letter was Eliab Washburn Murdock, the son of James and Ruth (Washburn) Murdock. He was born May 13, 1820, in Hebron, Maine. He married Sarah Ann Goodridge Banister in September 1848. Sarah, born March 18, 1816, was the daughter of John Goodridge of Boston and the widow of Samuel Bradley Banister of Boston. The Murdocks lived in Paris, Maine, where Eliab became owner of a grist mill. They had three children: Edward Wesley, Pauline Caroline, and Frederic Augustus. Eliab Murdock enlisted as a private in the 17th Maine Regiment, Company F in August 1862. He was wounded at the Battle of Chancellorsville on May 3, 1863 when Stonewall’s flanking attack cut off the 17th Maine — known as the Red Diamond Regiment — from the remainder of the Corps inflicting heavy casualties. 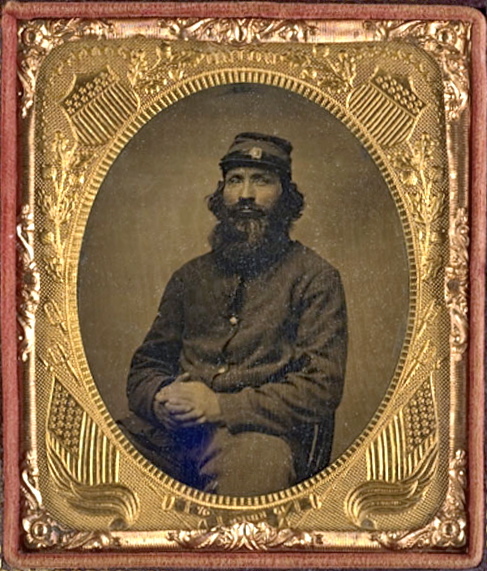 He re-enlisted in the Veteran Reserve Corps (formerly called the Invalid Corps) in August 1864 and was discharged in November 1865 as a corporal in Company D of the 1st Regiment of the Corps. Sarah Murdock died on April 16, 1876 and Eliab Murdock died on June 1, 1877. Eliab’s Civil War letters to his wife are housed at the Raymond H. Fogler Library at the University of Maine. Murdock wrote the letter to Silas Packard Maxim (1827-1884), the son of Capt. Silas and Hannah (Packard) Maxim of Paris, Maine. I received your dispatch today. It was delayed by being delivered through the P.O. I replied to it although I felt embarrassed in so doing. The parties referred to in my letter to T. C. Cushman had disposed of themselves during the week. Many soldiers belonging to Maine have re-enlisted in our Corps and were allowed their own selections of town to which to be accredited. An Order was issued by the War Department today requiring all re-enlisting hereafter to be accredited to their original towns. This arrangement has broken up competition between the re-enlisting agents and I think it just. The prices paid here for men re-enlisting by our Maine agents has varied from $3.00 to $5.00. I have been offered the latter sum myself to re-enlist for three years but declined to alienate myself from my own town. I hope you will be able to fill our quota without resorting to such high bounties. If, however, men are required by the town at such prices, I wil myself re-enlist in the present emergency. Such arrangements are made by the War Department that all necessary papers can be made here to insure the safety of the transaction. For instance, men re-enlisting can receive the State Bounty ($300) here as soon as mustered in and can receive the town compensation on producing sufficient vouchers that they have re-enlisted and been properly accredited &c.
You would oblige me much by writing me how you succeed in filling our state quota and the bounties paid &c. and in return I will at all times give you any information which lies in my power of matters pertaining to our common interest. P.S. The man referred to in my dispatch today is eligible to accredit to our quota and I think can be depended on if required before the 3d day of next month. — E. W. M.
This entry was posted on Tuesday, May 27th, 2014 at 2:07 pm	and posted in Uncategorized. You can follow any responses to this entry through the RSS 2.0 feed.